Plastic Die for Automobile Parts, Automobile Cover Die generally refers to the automobile shell sheet metal die, automobile accessories or automobile interior die generally refers to the automobile plastic die. Hongkaiyun Technology has many years of cooperation experience with US-funded automotive service providers, and has rich experience in automotive interior and functional parts plastic mold manufacturing. Precision Mold Factory Mould is a tool for forming articles, plastic mould is a tool for forming plastic products, these tools are composed of different parts. 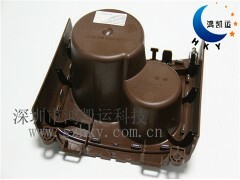 At the same time, the die is the necessary tool to realize the mass production of products. According to the performance requirements of different products, the precision can reach 0.005mm. Compared with machine processing, it has the advantages of high efficiency, low cost, high precision and good consistency. Japan MITUTOYO CMM instrument and projection cubic element are used to measure die size and product size with high precision. The precision of the product is (+0.02 mm) and the service life of the die is 500,000 times without distortion. Lung Kee Mould base is fixed to ensure die accuracy, production life and original product data preservation. Injection Molding Material: More than 10 years imported raw material agent supply, strictly control product size shrinkage, appearance color difference, pioneer and other errors, while ensuring environmental requirements. Emergency production plan flexibly solves customers'urgent needs and ensures delivery time. Provide all technical support in die life, all problems in one step.